- Background: Why do we need more revenue? UPDATE 4/9/2013: On Apr 8, the House passed Leadership’s flawed and inadequate Joint Ways and Means (JWM) Transportation Funding bill. However, it did not pass with a veto-proof majority, meaning, what the final revenue package looks like is very much still in play. Gov Patrick has promised to veto if the bill, in its current form, reaches his desk. On Thursday 4/11/2013, the SENATE votes, and we believe that the progressive position –vote no– has a decent chance of prevailing… if we continue to contact the Senate, pressuring those on the fence to vote “NO”, and thanking and encouraging those Senators who have shown their commitment to a “no” vote already (the politics are rough! let’s give them our thanks and support for sticking it out!). Your calls and emails and other conversations* with your State Senator are just as important as ever. Keep it up. And thank you. The Campaign for Our Communities is committed to improving the quality of life for Massachusetts families and strengthening our economy. We need to make smart investments in our people and communities. To fund those investments we support tax reforms that will raise substantial new revenue while holding down increases for low and middle income families. *Significant means around $2 billion, the amount necessary to address MBTA, education, restore budget cuts to services, spurred by tax cuts in the 1990s and the Great Recession. A smaller amount will only be a temporary stop-gap, and we’ll continue going from crisis to crisis and continue to need to cut programs, raise fees, and raise taxes again. Let’s do it right the first time. We need to invest in our communities and keep middle-class families working and earning! “An Act to Invest in Our Communities,” legislation filed in January 2013 by Rep. Jim O’Day [HD 1359] and Sen. Sonia Chang-Diaz [SD 555] does just that. By allowing us to invest in education, innovation and infrastructure, this proposal builds on our state’s strengths, making life better for our families today and into the future. By asking more from high income households and investors who received large windfalls from the Bush tax cuts, while raising the personal exemption as a way to hold down the tax increase for middle-class families, the bill raises needed revenue primarily from those who can best afford to pay. In his State of the Commonwealth address in January 2013, Governor Patrick outlined a bold and exciting new proposal to raise revenue through raising the income tax while cutting the sales tax. The Governor’s plan is ambitious and follows the same core principles as the “Act to Invest In Our Community:” that investment in our infrastructure and education is imperative to our economic vitality now and in the future, and revenue should be raised progressively, with vulnerable citizens protected. Over the course of the next few months, both the House and the Senate will consider the Governor’s proposal and other revenue bills and proposals. The climate seems ripe for new revenue but a strong grassroots case must continue to be made and pressure exerted on reluctant legislators. We continue to urge legislators to co-sponsor ACT TO INVEST, or make their support for new revenue public. Doing so will demonstrate a strong public commitment to the Governor’s aims and needs and values of all Massachusetts voters. 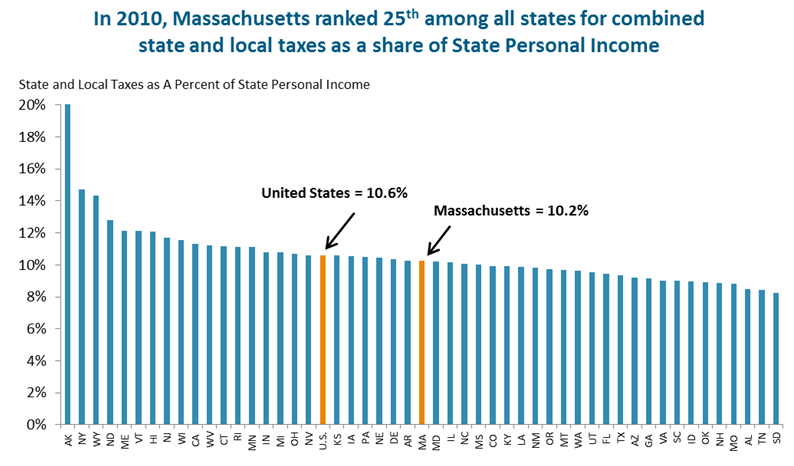 That means that the wealthiest Massachusetts earners have been paying far less in taxes than their poorer counterparts. Restore the income tax rate from 5.25% to 5.95%, but also raise the personal exemption enough to hold down increases for middle-class families. Raise the tax rate on investors, but also provide a targeted exemption for middle-class seniors. Raise $2 Billion in net additional revenue to maintain funding for our communities, schools, and health care. A personal exemption of $7,900 for tax years beginning on or after January 1, 2014. A personal exemption of $10,300 for tax years beginning on or after January 1, 2014. A personal exemption of $15,800 for tax years beginning on or after January 1, 2014. In determining the Part A and Part C taxable income of persons who are 65 or older, or who are disabled, an exemption shall be allowed upon the sum of the Part A and Part C adjusted gross income of such persons in an amount equal to the lesser of $2500 and one third of the sum of such Part A and Part C income for a single person, or a married person filing a separate return, whose total federal adjusted gross income is less than $40,000, and in an amount equal to the lesser of $5000 and one third of the sum of the Part A and Part C income for a married couple filing a joint return whose total federal adjusted gross income is less than $80,000, provided, however, that if only one spouse is 65 or older or is disabled, the exemption shall not exceed $2,500. Part A taxable income consisting of capital gains shall be taxed at the rate of 8.95 per cent for tax years beginning on or after January 1, 2014. Part A taxable income consisting of interest and dividends shall be taxed at the rate of 8.95 per cent for tax years beginning on or after January 1, 2014. Part B taxable income shall be taxed at the rate of 5.95 per cent for tax years beginning on or after January 1, 2014. (2) are held for 3 years or more, which shall be taxed at a rate of 3 per cent; provided, however, that in order to qualify for the 3 per cent rate, such investments shall be made within 5 years of the date of incorporation and, to the extent consistent with the provisions of this subsection, shall be in stock in a corporation that satisfies the requirements for treatment as “qualified small business stock” under section 1202 ( c) of the federal Internal Revenue Code, without regard to the requirement that the corporation be a C corporation. Over the course of the next few months, both the House and the Senate will consider the Governor’s proposal and other revenue bills and proposals. The climate seems ripe for new revenue but a strong grassroots case must continue to be made and pressure exerted on reluctant legislators. We continue to urge legislators to co-sponsor ACT TO INVEST, or make public their support for new revenue. Doing so will demonstrate a strong public commitment to the Governor’s aims and needs and values of all Massachusetts voters. While in the legislative process, the details of the various revenue packages will change, here are points of comparison between the Governor’s proposal and ‘Act to Invest,’ in their present form (2/2013). Indexing the Motor Fuels Tax to inflation, which would prevent the further erosion of collections from this source. Increasing the cigarette tax by $1 per pack, thus raising the tax to $3.51 per pack (raises $150 million/year). $27 million from enhanced tax enforcement by the Department of Revenue, using special software and processes to identify promising collection and audit opportunities. $2.6 million from the eliminating the exemption from the room occupancy excise tax for certain types of short term room rentals (such as B&Bs, rental vacation homes, and corporate executive temporary apartments). Background: Why Do We Need More Revenue? The result: even during the strongest years of economic growth our state was barely able to fund essential services, and in recessions we have had to cut deeply. Total state aid to cities and towns in Massachusetts—including aid for education and general local aid—has declined by about $1.7 billion. Education funding is essentially flat. Non-education aid is currently at its lowest point in 30 years, with a $1.3 billion decline. Connect with other supporters in your area — contact us to get started! Check our “What’s New” tab for our all our blog posts.